Larry Byrne recently returned to Freeh Group International Solutions, LLC (“FGIS”) as a Managing Director. He previously was a Managing Director at FGIS from 2013 to 2014. From 2014 to 2018 Larry served as the NYPD Deputy Police Commissioner and Chief Legal Officer for the NYPD. He is, deservedly, the 2018 recipient of the Lumbard Bowl which is awarded annually by the Office to an SDNY alumnus. Kudos to Tomback & Sahni on acquittals! U.K. Traders Acquitted in New York Federal Court of Conspiracy to Violate U.S. Antitrust Law. Congratulations to Anjan Sahni of WilmerHale and Andy Tomback of White & Case. On October 26, 2018, after a 3-week trial before Judge Berman, the jury acquitted Andy Tomback’s and Anjan Sahni’s clients, Richard Usher and Rohan Ramchandani, of conspiracy to violate the Sherman Act. Usher formerly worked as a FX trader at Royal Bank of Scotland and JPMorgan Chase, and Ramchandani was a FX trader at Citibank. Both men have returned home to London to rejoin their families cleared of all criminal wrongdoing. The acquittal came after a 5-year, multimillion-dollar investigation by the Antitrust Division involving more than 20 FBI agents at a given time, 250 witness interviews, 2,700,000 documents and 200,000 phone calls. The government’s star cooperator (another FX trader, who worked at UBS and Barclays) testified for days at the trial. The jury deliberated just over four hours (including lunch). A rare trial and even more rare acquittals. Well done. The John S. Martin Jr. Association 38th Anniversary Celebration will be Wednesday, November 28th at the Yale Club. If you were not on a recent email from his assistant, you can contact her directly: Catherine McIntyre at catherinemcintyre870@gmail.com. Another member of the SDNY family has opened his own law firm. In case you missed it in Law360, Pablo Quiñones recently opened Quinones Law PLLC (www.quinoneslaw.com), a white-collar boutique law firm that represents companies and individuals when the government comes knocking and that provides corporate compliance counseling and monitor services. His bio is impressive (https://quinoneslaw.com/attorney/pablo-quinones/) and he’s eager to help some clients, so please reach out to him with good wishes and referrals. Our interpreter for many years, Dena Millman, has gone out on her own. Our favorite court interpreter, Dena Millman, has gone out on her own after many years helping us in court, where she was appointed Chief Interpreter by the SDNY judges in 1980, and later when she went in-house with us in the Office from 1995 through April of this year. As Dena has explained to me: “During my 23 years at the USAO my work was so varied. I covered hundreds of proffers to prepare for trial, thousands of undercover wiretaps and recorded meetings, witness interpretation at trial, video conferences with subjects in Latin America, and countless legal translations.” She remembers two of her biggest assignments: working with AUSAs Randal Jackson and Pablo Quiñones on the FARC trial of Colombian guerrillas, and assisting AUSA Michael Rosensaft in preparing the Portillo case against the former President of Guatemala indicted for money laundering. As many of us remember Dena and her work, she had an incredible ability to go beyond standard interpretation to conveying the real essence of spoken Spanish in all of its various South American dialects, whether it was ordinary, slang or technical. She is available for regular legal work and pro bono assignments so let’s keep her in mind. Her contacts: damecuta@aol.com and 917-647-7800 . Earlier this year, Linda joined a firm in Boston that specializes in bringing whistleblower actions under the False Claims Act and other statutes. She would love to hear from people and can be reached by email at linda@thomasdurrell.com or linda.severin@outlook.com or by phone at 857-245-8186 (direct) or 857-636-0965 (cell). Per the below, it is now official and I will be leaving the NYPD on July 31. It has been a privilege to work here for the last four years and I’m very sad to leave. I am considering several different options but I have not made any final decisions yet. My only firm plan is to walk out of 1PP on July 31 and spend August and September in Montauk. See you soon. After july 31 I can be reached by email at byrne.334@gmail.com and on my personal cell at 914-588-2996. A Las Vegas lawyer has been acquitted of all charges in an alleged scheme to manipulate the stock price of a technology company. Federal jurors in Brooklyn, New York, acquitted Kyleen Cane on charges of conspiracy and securities fraud, Law360 reports. Her co-defendant, Abraxas J. “A.J.” Discala, was convicted of securities fraud, wire fraud and conspiracy in the alleged pump-and-dump scheme. Discala was CEO of OmniView Capital Advisors and is the former husband of Sopranos actress Jamie-Lynn Sigler. Reuters and a press release also have information. The government had claimed Cane secretly controlled free trading shares of Cubed Inc., a company said to be developing an app, then set up escrow accounts to sell the stock while other conspirators manipulated the price, according to Law360. Lawyer Roland Riopelle represented Cane. Wednesday, June 6, 2018 | 6:00 p.m. There is no charge for this program. Registration is not required. The City Bar will mark the 26th annual presentation of its awards to four outstanding assistant U.S. attorneys from the Southern and Eastern Districts of New York. A reception will follow, with prior winners in attendance. Presented annually to outstanding Assistant U.S. Attorneys in the Southern District and in the Eastern District of New York, the medal is awarded in honor of Henry L. Stimson, who served as U.S. Attorney for the Southern District from 1906-1909 and as President of the Association from 1937 to 1939. The awards are made possible by the generosity of the firm of Pillsbury Winthrop Shaw Pittman, Henry Stimson’s legacy firm. Effective May 1 after nearly 10 years I retired from Freshfields Bruckhaus Deringer US LLP and decided to join Louie Freeh’s firm, Freeh Sporkin & Sullivan. I can be reached at Romano@freehsporkinsullivan.com, or bromano@mindspring.com. You could sell tickets to the meeting, if there will be one, between Rudy and Barbara about allegedly privileged communications between Trump and Cohen in the materials seized by the stormtroopers (the President’s words, not mine) from Cohen. In a rare trial and a more rare acquittal, Marc Mukasey prevailed for the defense in a spoofing case brought against a UBS metals trader. Bravo, Marc! We need more of these. Best, Ed. We, the undersigned, are proud alumni of the United States Department of Justice. We served this institution out of a commitment to the founding American principles that our democratic republic depends upon the rule of law, that the law must be applied equally, and that no one is above the law. Many of us served with Robert Mueller and Rod Rosenstein. Those of us who served with these men know them to be dedicated public servants committed to these principles. All of us served with thousands of their peers at the Department, who also swear an oath to serve, defend, and protect the United States, the Constitution and the American people. We know that there are thousands of public servants at the Department today who serve these principles and all of us. We are therefore deeply disturbed by the attacks that have been levied against the good men and women of the Department. Not only is it an insult to their public service, but any attempt to corrupt or undermine the even-handed application of the rule of law threatens the foundation of our Republic. We know the people who serve at the Department will bravely weather these attacks and continue to uphold their oaths by doing only what the law dictates. But it is up to the rest of us, and especially our elected representatives, to come to their defense and oppose any attempt by the President or others to improperly interfere in the Department’s work, including by firing either Mr. Mueller, Mr. Rosenstein or other Department leadership or officials for the purpose of interfering in their investigations. Should the President take such a step, we call on Congress to swiftly and forcefully respond to protect the founding principles of our Republic and the rule of law. Helen Gredd let me know that Lisa Zornberg recently gave a speech about Mary Rutter Towle, who was the first woman made a SDNY AUSA. She was sworn in on June 15, 1921 by then U.S Attorney Colonel William Hayward. Women had been given the right to vote only the previous August. U.S. Attorney William Hayward, in appointing her. Towle worked in the Office until her retirement at the age of 70. Hayward also appointed the first African-American AUSA, James C. Thomas, Jr., one month after he appointed Towle. Hayward was apparently a real liberal for his time, having commanded a regiment of African-American soldiers during World War I. He organized the regiment with voluntary recruits from Harlem, and named them the Harlem Hellfighters. When the U.S. Army wouldn’t permit them to engage in combat, Hayward brought them over to fight with the French Army, and together they received the Croix de Guerre for their valiant fighting. Frank Wohl is receiving the Ostrow Award at the annual NYCDL Ostrow Luncheon on Friday. https://nycdl.org/ostrow-award/ Hope to see a lot of you there. The Percoco jury is still out. Good luck to alums Barry Bohrer, Dan Gitner and Debbie Landis. Judge Caproni is still pushing the Silver case to go to trial next month on April 16th. Good luck to Mike Feldberg, who just came in for Silver. Judge Wood gave Bob Gage a small break setting the other political retrial in the Skelos case for June 18th. Any other upcoming trials we should know about? Summations in Percoco trial are now set for next Tuesday. I should have mentioned that two other alums, Dan Gitner and Milt Williams, are also on trial with Barry Bohrer representing other defendants in the Percoco case. Debbie Landis just let me know that summations are set for next Tuesday. As you may know, the government’s main witness was blown up on cross when he admitted that, in violation of his plea agreement, he committed at least one further crime when he disavowed an American Express charge for staying at the Waldorf while coming to the City for witness prep with the prosecutors. Can’t make this up. They violated him on his agreement and locked him up for the rest of the trial. Looking forward to the summations, best, Ed. Our website has been down due to the proverbial “technical difficulties” but after hours with GoDaddy, we are back up. This was caused by the need to add extra security so the Russian hackers wouldn’t get to you. I wish I could say that’s just a joke. I am pursuing other alums who have not yet registered and would appreciate hearing from you if you know of some. Barry Bohrer is still on trial in the Percoco case and I’ll try to let you know when summations are given. They will definitely be worth attending if you have the time. On that note, please let me know of any other trials scheduled in the SDNY. I know that Sheldon Silver has switched lawyers to Mike Feldberg, and Judge Caproni is holding him to the April 16th trial date originally scheduled. P.S. You can always email me directly with news to post at little@hugheshubbard.com. Geoffrey Berman has just named Rob Khuzami his Deputy. They served together back in 1990 et seq. Trump just appointed Geoffrey Berman of Greenberg Traurig (Rudy’s firm) as interim U.S. Attorney SDNY and is nominating him for the permanent position. He likewise appointed Richard Donoghue, formerly Chief of the Criminal Division in the EDNY, for the top position there. Thirty years ago, Larry’s brother, Eddie Byrne, was a police officer sitting in his patrol car protecting a local resident in South Jamaica, Queens when he was assassinated on the order of a jailed drug dealer. Larry was only in the Office for three weeks when Eddie was killed. He tells me the outpouring of support from the Office and the Alumni network at that time was quite extraordinary and a great comfort to him and his family in the wake of this terrible tragedy. 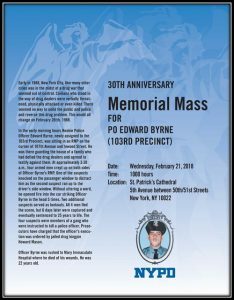 To commemorate his sacrifice Cardinal Dolan will say a Memorial Mass for Eddie on February 21 at St. Patrick’s Cathedral. February 21 was Eddie’s birthday and he was killed only five days after his 22nd birthday. Larry is now Deputy Police Commissioner in the New York City Police Department.